Place the black-eyed beans in a saucepan with two litres of water and bring to the boil. Then drain the beans in a colander, place them back in the pan with fresh cold water and bring to the boil again. Reduce the heat to medium and simmer for 20-30 mins until tender. The fresher the beans are, the faster they cook. Meanwhile in a deep skillet over a medium heat, add 1/3 of the olive oil and cook the onion and garlic, stirring occasionally until wilted. Add the chopped greens and spring onion to the skillet, season with salt and pepper, cover with the lid and cook for 15-20 mins until soft. Add some boiling water if extra liquid is required. 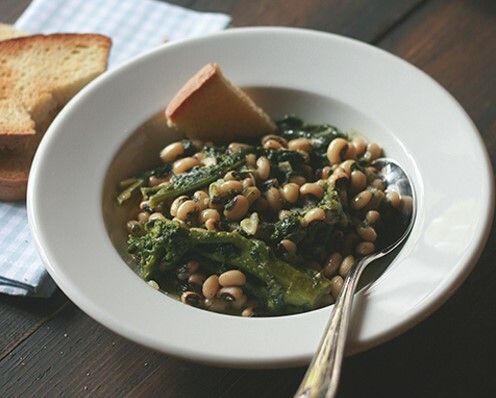 When the greens have cooked, drain the black-eyed beans, discard the water and add the beans to the skillet with the greens, stirring gently to combine. Cook for a further 5 mins, and just before you remove the skillet from the heat add the rest of the olive oil. 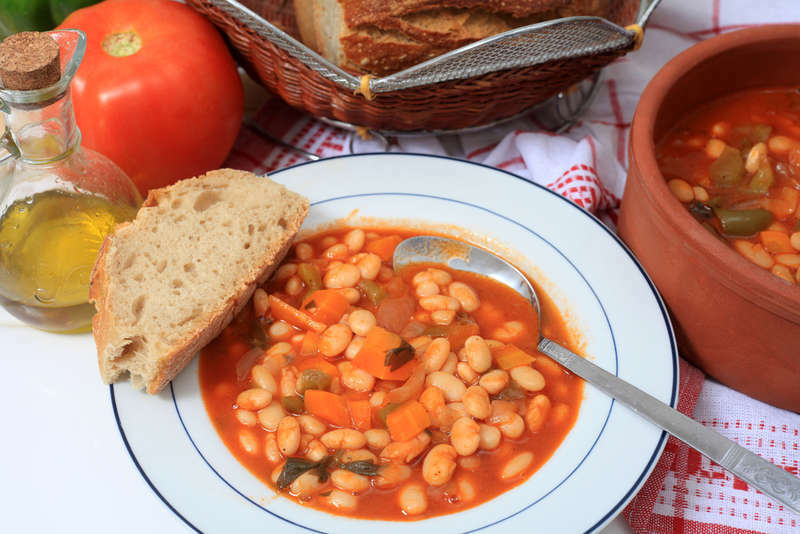 A hearty and nutritious soup, this is considered to be the national dish of Greece, the staple food of the army and every poor man’s meal – so great for the crisis! It is usually made at home or at village festivals; do not expect to find it in many restaurants. It can become a substantial meal by adding pieces of pork, bacon or sausage and the kids will love it. 400g (15 oz) can of chopped tomatoes (sometimes I use fresh tomatoes and blanche and skin them myself). Drain the beans, place in a large pan and cover with fresh water. Bring to the boil and cook for ten minutes, then drain. Cover again with cold water, bring to the boil once more, lower the heat, cover and simmer for 1-2 hours or until the beans are tender but intact. Add all the other ingredients, except the parsley and simmer for a further 30 minutes. Add parsley, salt and pepper to taste and simmer for 1-2 minutes more. Serve with crusty bread, olives and dry white wine. I always add the olive oil at the very end, but most people add it with the other ingredients. The good thing about adding the oil at the end is that the natural, raw flavours of the oil come through so you don’t actually use as much. You do however need the very best virgin olive oil and I would recommend coarse grain salt as well. One and a half hours from Athens airport and forty minutes East of Patras, Achaia in the North of the Peloponnese attracted the Ancients for good reason. The area is immensely fertile with bands of citrus plantations situated on the silt plains next to the sea. Above, lie olive groves punctuated by vineyards and surrounded by Mediterranean pine forest. 1000 metres above sea-level, cows graze on alpine meadows surrounded by spruce forests, littered with mushrooms and populated by wild boar. Goat herders drive their flocks to these highland areas in summertime when the heat below becomes unbearable. Above the 1800 metre zone when the spruce trees start to become sparser, the peaks of the mountains that reach up to 2500 metres are snow- capped and it is possible to ski until the end of April if the winter remains cold. There are three mountains in Achaia whose concave formation plunge dramatically into the Gulf of Corinth below. Each mountain is separated by Alpine valleys and gorges where the scenery is spectacular. The seaside towns of Kiato, Derveni, Akrata, Egion and finally Patras are nothing out of the ordinary but the sheer beauty of the mountainous scenery is simply breathtaking. 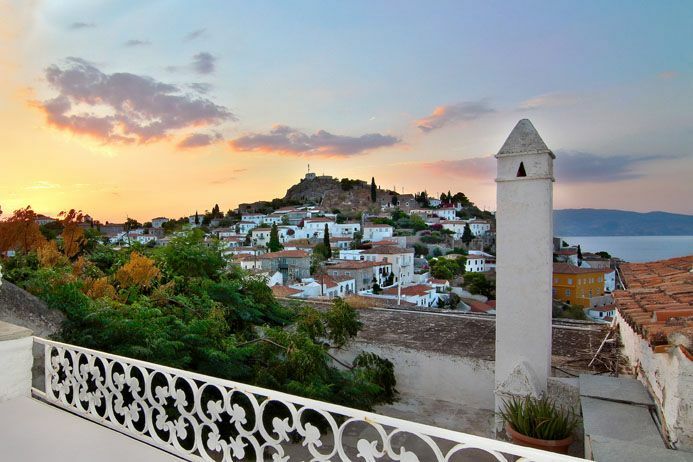 This region abounds with charming mountain villages and with many archaeological and historical sites to discover such as Ancient Egira and Ancient Corinth. 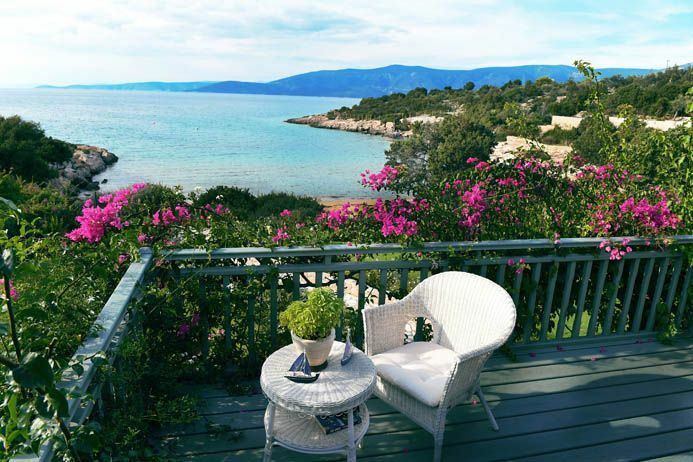 It is also within easy reach of other major sites such as Delphi, Mycenae, Epidavros, Olympia and Athens. Spring and autumn are fabulous times to visit this beautiful area. The mountains provide a walker's paradise and the many well-marked paths offer unique opportunities to the fell walker or rambler. Although these foot paths are well marked, they are deserted and you can spend the whole day with out meeting a soul. In spring the mountains become ablaze with wild flowers which open out in sequence. First the poppies arrive turning the mountains blood red, next yellow becomes the dominant colour, then the dainty anemones or 'wind flowers' and finally, the Judas trees with their dense pink buds. Wild greens, asparagus and artichoke can all be collected through these blissfully warm months under clear skies. In autumn comes a second flowering with warm weather bathed in a golden light. The mushroom season starts and the forest are littered with all types of species: Oyster, morel, chanterelle, boletus and field mushrooms can all be found up in the alpine forests of Achaia. The mountain villages of this area lie untouched completely by tourism. Here you will probably find a square, the local church and usually a spring with cold, mountain water. Even the smallest and remotest of villages usually have a Kafeneion where the men drink coffee, discuss and play tavli around the fireplace. The mountain tavernas abound with delicious food, creamy feta cheeses, home-baked bread, dishes of wild rabbit, boar or cockerel, and sometimes even trout from the nearby river. Clean the mushrooms and remove the stalks. Set aside 100g (1/4lb) leaving them whole, and finely chop the remaining mushrooms. Heat the butter and olive oil in a pan and soften the onion and garlic. Add the chopped mushrooms and sauté. Pour in the chicken stock, season with nutmeg, salt and pepper then cover and simmer for 10 mins. Heat a little oil in a pan and fry the whole mushrooms. Pour in the milk and add to the soup. 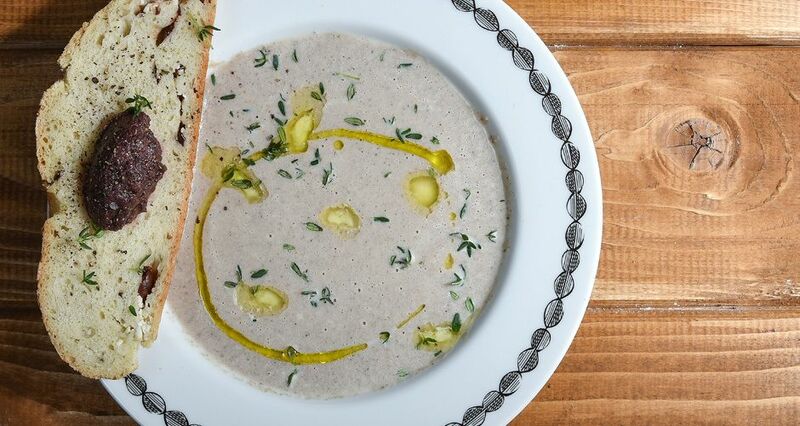 Serve the soup in deep plates with a splash of cream, and garnish with parsley. Lying South of Athens and very easy to get to, artistic, bohemian in style, a ‘hang out’ for the stylish, sophisticated and sometimes famous, Hydra is definitely a place well worth considering as a summer destination. With the prices of air-flights to the Ionian soaring, it’s worth taking advantage of the cheap offers made by budget and schedule airlines that arrive into Athens International. The new Proastiakos railway as well as the Metro terminate in the airport building so it is very easy to reach the port of Piraeus to catch an interconnecting hydrofoil that will whisk you within 1½ hours to Hydra. All forms of transport are prohibited on Hydra so no need for car hire. The island has benefited hugely from this ruling – no smelly engines or noisy mopeds to interfere with the simplicity of life and the peacefulness of the majestic surroundings. One must be prepared to walk in Hydra since all properties are located across three hillsides and most of them are at least a 10-15 minute climb. Once up, sitting on your veranda, the views are just superb and the tendency is to remain there sipping your preferred beverage and enjoying clean air and blissful silence. The villages of Kamini and Vlychos lie to the west of Hydra town and can be easily accessed by water taxis or by local caique boats found on the quayside in front of the clock tower. All have pebbly beaches so ‘jelly’ shoes are recommended for those with tender feet! Good local food is served in the tavernas which are dotted along the coastline. Further west is Bisti Bay, a favourite for snorkelling and exploring. A wonderful thing to do is to search for the black spiky sea urchins, break them open and guzzle them in oyster fashion with some lemon juice, olive oil, crusty bread and of course some chilled white wine. There are other secrets to be found on the nearby island of Dhokos which, like all the other suggested places, are best accessed under the experience of one of the local caique boat captains. They aren’t too expensive and it is ‘a must’ for at least one day of a holiday. The seadogs know the secrets and can steer you in the right direction! Autumn and springtime are fabulous seasons to visit Greece especially if your interests extend beyond the beach. Hydra is a choice destination for an alternative holiday and the network of walking paths that line the inland offer a walker’s paradise. Most of the paths are dirt tracks mainly used by the donkeys. GPS compatible OS maps are available in many of the shops that line the harbour so with a hand held device it is very hard to get lost. The island is long and narrow so it is easy to explore the heartland which is dotted with monasteries and a profusion of flowers especially in the spring. A favourite hike is along the west coast of Hydra to a Byzantine village called Episkopi. The walk along the coast road is reasonably flat, until you arrive at the little harbour of Palamidas, then the route goes inward and upwards through a lush forest of pine trees. Following the track you arrive at a little group of houses, surrounded by olive groves. The local people respond warmly to a friendly smile and a greeting of "Yasou". Generous invitations are often made, to sit for a while and enjoy whatever has been prepared that day. Remember that the local wine has quite a kick and the only way back is by foot! Whether we are out at a taverna or dining at home, there is one constant on the table. The production of cheese in Greece dates back over 6,000 years. The ancient poet Homer describes the production of cheese, like feta and kasseri, in his epic works. 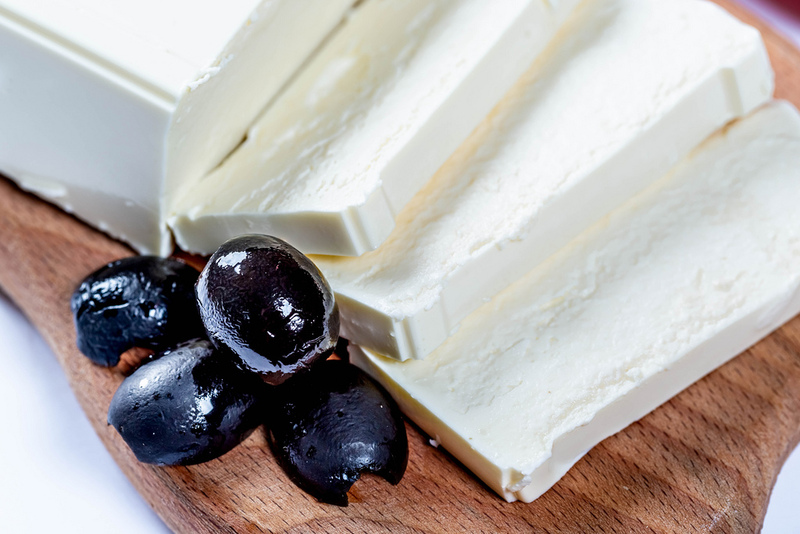 Greece is still an important producer and exporter of a wide variety of cheese today, with the majority of the production coming out of Northern Greece. Most Greek cheese is made from sheep’s or goat’s milk since such a mountainous country cannot support vast herds of cattle. Many countryside housekeepers still make their own cheese using traditional methods. Straining the heated milk through a cheesecloth, allowing to stand and then slicing to release more whey. The word feta means slice in Greek and it is from this part of the process that the cheese gets its generic name. It was produced to be able to withstand time without being refrigerated. The salt and liquid in which it is stored help it maintain freshness even in warmer conditions. You can buy feta packaged or you can get it from the delicatessens or supermarket deli straight out of the barrel and most regions produce their own local version each one varying in taste from the other. Feta is excellent in salads, baked or served on its own as an appetizer. It is a standard side dish with any Greek meal. Kasseri cheese is also commonly used. Made from sheep’s milk it is a mild, semi hard, pale yellow cheese that has a tendency to be slightly oily. It is a little salty and slightly pungent, but has a sweet finish. In Greece, Kasseri seems to have taken the role of mozzarella. It is easy to slice and use for sandwiches, as well as chopping in small cubes for hors d'oeuvres, added to pizzas, omelets or baked in filo dough to make cheese pies. Thessaly, Macedonia and Mytilini are renowned for their Kasseri production. Mizithria cheese is produced from either sheep’s or goat’s milk. It is available in two forms. You can buy a fresh, sweeter Mizithra that is very soft, resembling a ricotta cheese. Sifnos Island produces Mizithria locally and it often replaces feta in their horiatiki salata (Greek Salad). Aged Mizithra is firm and quite salty. As a hard cheese that doesn’t melt very quickly, it can be easily grated and added nicely to pastas and as a top off to other cheesy dishes. Graviera cheese is a personal favorite! It is a light yellow, hard texture, wheel cheese with an external rind that is very versatile. Naxos and Crete are most widely associated with this particular type of cheese. Crete uses sheep’s milk to make their famous Graviera, while the Naxos version is made from mostly cow’s milk. It is excellent served as an appetizer and adds a zing to anything. It can be fried up saganaki style, served in salads, grated and used in combination with most other cheeses for things like stuffed peppers or on pasta. It can even be sliced and added to a sandwich to give it a richer flavor. The flavor is fruity and nutty with the Cretan varieties having a heavier caramelized taste. Kapnisto Metsovone is one of Greece’s only smoked cheese varieties. It makes its way to our dinner tables from the village of Metsovo, in Northern Greece, 1200 meters high up in the mountains. It is a mild, smoked, yellow, semi hard, wheel cheese that is known for its high quality. It is delectable by itself, but also goes perfect in a sandwich or served as an hors d'oeuvres with smoked salmon or crackers. Kefalotiri is made with a combination of sheep’s and goat’s milk and sea salt. It has a tangy, sharp taste and is dry and salty. In some seasons, the cheese is almost white, but also appears again in a golden yellow. The texture is very hard, therefore, is primarily used for frying or grated and added to stews and sauces. 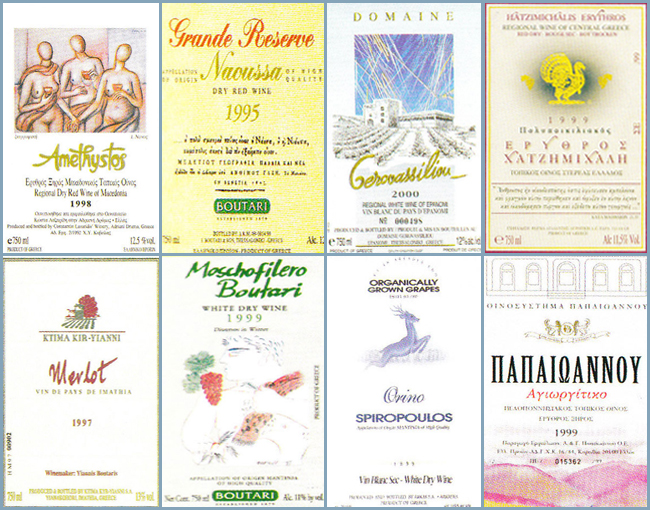 Kefalotiri is made in several regions of Greece, including the Ionian and Cycladic Islands. Kefalograviera is made from sheep’s milk and is used similarly to Kefalotiri. The flavor is between Graviera and Kefalotiri. Often fried for ‘saganaki,’ grated or used as a table cheese, it pops up often in a Greek meal. Western Macedonia and Epirus are large producers of this type of cheese. Other cheese worth mentioning are Anthotiri and Manouri which are similar to the soft Mizithra. They are often used in pastries or served with honey as a dessert. Part of the fun of traveling in Greece is sampling all of the great food. Wherever you travel in Greece, ask what cheese they produce locally. In the villages, some even make their own at home! Greeks are always proud of their local production and more than willing to let you have a sample to taste. You will find that there is something different to try just about everywhere you go. Just when you have declared your favorite, you will stumble across something new!